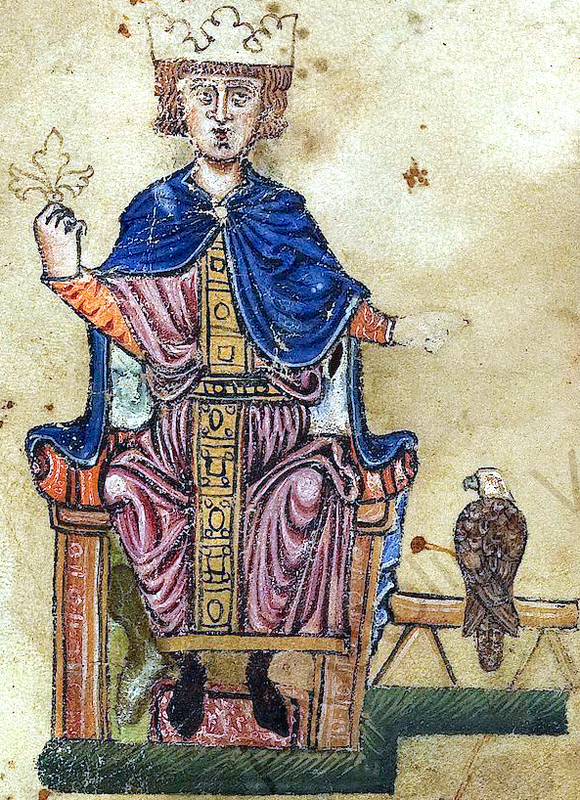 Frederick II, although a Hohenstaufen like his grandfather, was born in Sicily and brought up under the influence of Norman, Byzantine and Muslim cultures. He was a patron of the arts and sciences, and a philosopher, poet and scientist in his own right– writing a scholarly treatise on the art of falconry, among other things. He founded the University of Naples, and his court at Palermo was a center for learned men and for troubadours and minnesingers from France and Germany (possibly including the minnesinger known as “der Tannhäuser” and Wolfram von Eschenbach, the poet who wrote “Parzival”); the astronomer and magician Michael Scot; the physician, astrologer and magician Arnold of Villanova; the mathematician Leonardo da Pisa, known as Fibonacci; and St. Thomas Aquinas. He was fluent in French, German, Italian, Greek, Latin, and Arabic. His vast erudition and wide range of talents earned him the nickname Stupor Mundi, the Marvel of the World. With respect to religion, Frederick viewed Christianity as little more than a means to expand his Empire. He was a essentially a libertine materialist, though he requested Christian absolution on his death bed. Although he participated in the persecution of Roman Catholic heretics, he was tolerant of Jews and Muslims, and welcomed them to his court. His troubles with the Church began when, after having announced his intention to go on a crusade at his coronation as King of Germany, he postponed actually taking up the cross for fifteen years; instead, he used the papal protection given a crusader to help him consolidate his holdings in Italy. Pope Honorius tolerated Frederick’s procrastination, but his successor, Gregory IX, was less charitable, and excommunicated him upon receiving the tiara in 1227 e.v. In defiance of the Church’s prohibition on the participation of excommunicates in crusades, Frederick immediately set out on his crusade. For this, he was excommunicated again. He landed in Acre in September of 1228 e.v., but his double excommunication made him extremely unwelcome among the crusaders in the Holy Land– because any person aiding an excommunicate or any village harboring an excommunicate would automatically be excommunicated as well. Despite this rather severe impediment, Frederick managed to win Jerusalem from the Muslims through skillful negotiations with al-Kamil, the Sultan of Cairo. He crowned himself King of Jerusalem on Sunday, March 18, 1229 e.v. For harboring the excommunicate King, the church was forced to excommunicate the city of Jerusalem, the very focus of Christianity itself. Pope Gregory was naturally furious over this entire affair. He attacked Frederick’s positions in Italy, and Frederick was forced to leave Jerusalem to defend his Italian territories from the papal forces. Gregory’s successors maintained the struggle against Frederick over his Italian claims, and in 1245, Pope Innocent IV deposed Frederick and declared a crusade against him. Once again, Frederick thwarted their plans, this time by dying peacefully at one of his castles in Apulia on December 13, 1250 e.v. The church had finally prevailed against Frederick, but at very great expense in both resources and credibility. There has been some confusion in Masonic circles between Frederick II of Hohenstaufen and Frederick II “the Great,” King of Prussia (1740-86 e.v.). In Masonic legend, it was Frederick the Great who supposedly issued the Charter authorizing the formation of the Ancient and Accepted Scottish Rite. It is sometimes said that Frederick the Great was the first to “shake the power of the Papacy,” but this honor clearly belongs to Frederick II of Hohenstaufen.